When a brave young farmboy (Kerwin Mathews) saves Princess Elaine (Judi Meredith) from the clutches of a giant, he is made a knight and charged with the task of protecting her. Soon he finds himself battling other monsters conjured by the evil wizard Pendragon (Torin Thatcher). 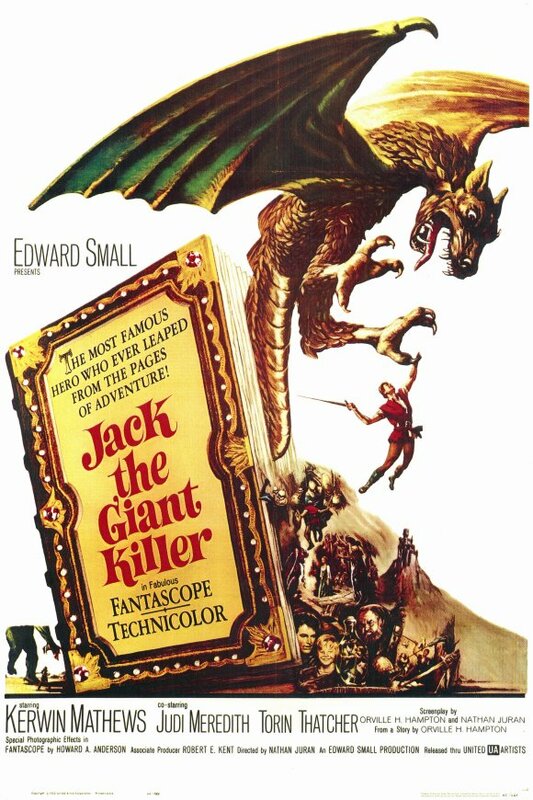 It’s easy to see why Peary lists this much-maligned fantasy flick in the back of his book as a Sleeper — it’s been so roundly dissed as simply an inferior imitation of Ray Harryhausen’s stop-motion adventures that it never stood a chance on its own. While it’s true that the animation can’t hold a candle to Harryhausen’s creations, it’s exciting to see Jack battling various monsters, the story moves along at a fast pace, and the romantic leads are appealing. Jack the Giant Killer may not be must-see viewing, but it’s not awful, either. No, but it’s recommended for fans of fantasy flicks. Not a must, and in complete agreement here. The little ‘dancing man’ who later becomes a formidable monster may actually be a bit unnerving for those too young – esp. when the ‘wonderfully’ menacing Thatcher causes him to grow, tall and shadowy, in Meredith’s bedroom. Fave scene: the extended one at sea, in which evil spirits hover over, then descend upon an attempt at escape.